Editor’s note: Baseball is back and Yahoo Sports is previewing all 30 teams over the next month. This year’s previews will focus on fantasy and reality, as our MLB news staff and our fantasy baseball crew come together to assess each team before opening day. Next up, the Colorado Rockies. It was a wild finish to 2018 for the Colorado Rockies. They tied for the NL West lead on the final day of the season, then lost in Game 163 against the Los Angeles Dodgers. But the Rockies still made the wild-card game, where they beat the Chicago Cubs and then advanced to the NLDS where they lost to the Milwaukee Brewers. It’s exhausting to even read. 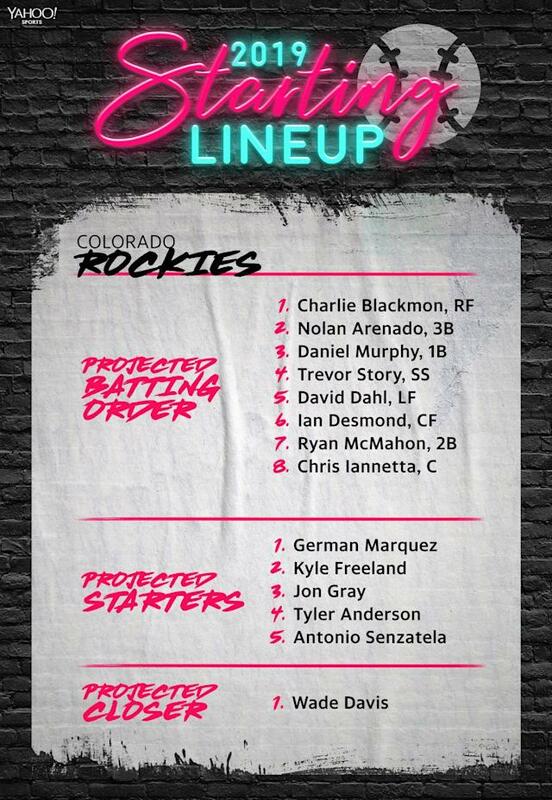 So this is a Rockies team hungry for more. They’ve got a very talented core, led by Nolan Arenado and Charlie Blackmon. Their pitching is actually pretty good, despite the Coors Field altitude and what it usually does to ERAs. They added veteran Daniel Murphy to an infield that also includes Trevor Story. In reality, the Rockies could win the NL West if things go their way. In fantasy circles, the Rockies are just as intriguing. Arenado is a guy you obviously jump at if you can get, and could go as high as third overall. Story and Blackmon will also come off the board early. David Dahl could finally be ready to breakout, and even some of the pitchers are worth a look. Daniel Murphy is coming off his worst season and will be 34 this year, but he could help if there’s some bounce-back in there. They brought back Mark Reynolds too, because power plays in Denver. 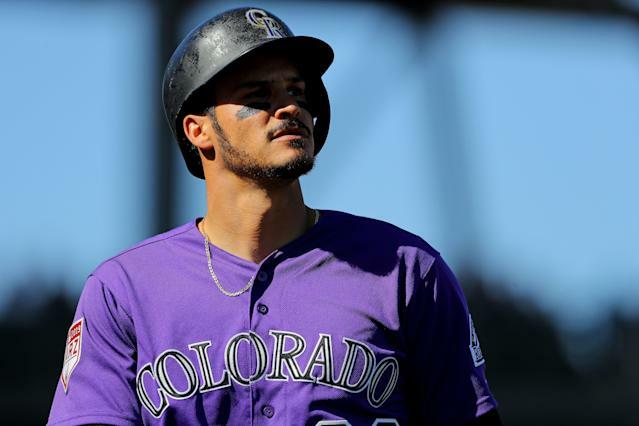 But not a lot has changed otherwise, except the really big one: Nolan Arenado isn’t going anywhere. Instead of entering his walk year with the Rockies, their star third baseman and perennial MVP candidate signed an eight-year extension worth $260 million last month. He’s getting paid handsomely and he’s proven himself to deliver for the Rockies over the years. Who will be Colorado’s fantasy breakout? What is the Rockies’ biggest fantasy question? The Rockies find themselves in a conundrum in 2019. Both of their top prospects are infielders, and it looks like there’s only one infield spot available at the moment. Currently, Garrett Hampson is penciled in as the team’s starter at second. The 24 year old isn’t a big power hitter, but should hit for a high average and provide speed in the majors. 1. Coors Field dominance: After a sluggish start (10-17), the Rockies rebounded to finish 47-34 at home last season. Those early slip-ups proved costly though, as the Rockies were forced into a division tiebreaker game against the Dodgers, which they lost in Los Angeles. Had Colorado hit 50 wins at home, it would have made a huge difference. They should aim for nothing less than that in 2019. 2. Hit better on the road: The Rockies home and road splits are a story every season, and that will likely never change given the circumstances. What did change last season was Colorado's fortunes away from Coors Field. For just the second time in franchise history, which dates back to 1993, Colorado posted a winning road record (44-38). The kicker is they did it despite batting .225, which was their lowest-ever road batting average. If that number comes up, the improved starting pitching could make the Rockies a road force.